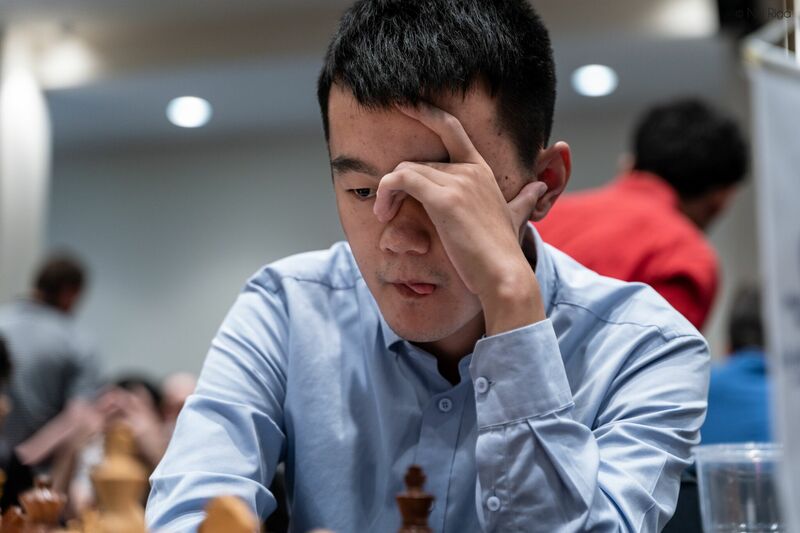 Magnus Carlsen is set to have the white pieces against Ding Liren in Round 6 of the European Club Cup, with a decisive result ending either the World Champion’s 7-year run as world no. 1 or Ding’s 14-month unbeaten streak. 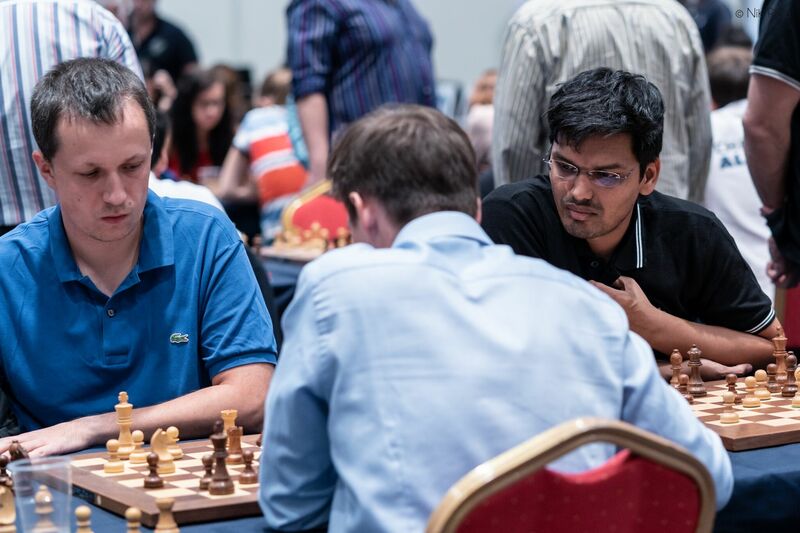 Their teams meet after the two hitherto perfect teams, Alkaloid (Ding Liren) and Obiettivo (Wang Hao), drew in Round 5, allowing AVE Novy Bor (Wojtaszek) and Valerenga (Carlsen) to catch them with two rounds to go. Borki Predojevic was the hero for Valerenga, keeping his nerve to beat Gadir Guseinov after all the other games were drawn. 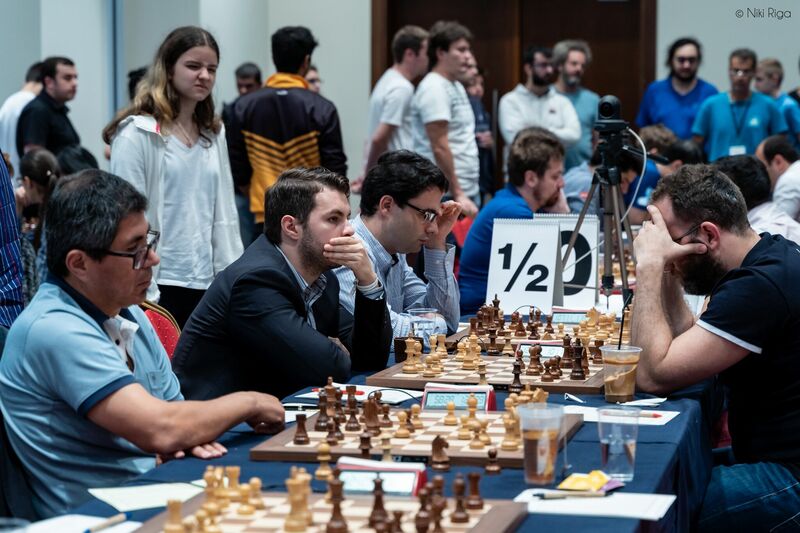 Top seeds Alkaloid got off to a winning start when Yuriy Kryvoruchko comprehensively outplayed Sabino Brunello on the bottom board, but it seemed for a while as though the 6th seeded Italian team Obiettivo Risarcimento Padova was going to pull off a sensational win. Daniele Vocaturo spotted a tactical flaw in Pavel Eljanov’s 28…g6? 29.Nxh6+! Kg7 and it seems the knight is trapped, but 30.Qf3! simply left White up a pawn, since 30…Kxh6 leaves the f6-bishop undefended. Daniele went on to convert his advantage smoothly. 21…Rxd4! 22.cxd4 Qd7! and Black is threatening both the f5-rook and another rook-winning fork on d4. 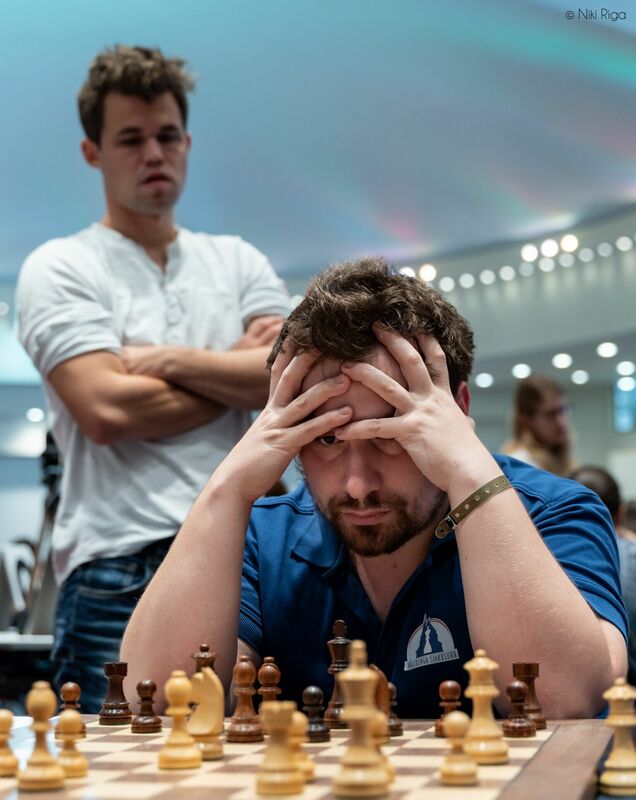 23.Rff1 was available to limit the damage, though, and despite Black having a powerful initiative Dmitry Jakovenko was able to do what he failed to do at the Olympiad for Russia and hold a difficult position. We have a very closely-knit team. We all like each other, there’s no friction, we support each other with opening advice and we help out when someone’s in a bad mood. In Batumi we played football in the pool and spent time together. Many teams could learn about building team spirit from us. The USA team features “mercenaries” - they’re all great, fine players, but they don’t have that chemistry among themselves. At times you need to sacrifice individual goals and, if the team’s leading by a point, then in an unclear situation it’s better to take a draw than to fight for an uncertain win and rating points. We had a lot of laughs after the matches, which boosts your spirits, and thanks to that the team functioned well, although individually we were often weaker than our rivals. At the 43rd Chess Olympiad in Georgia we showed that anything is possible, and that was no accident. Last year we won bronze medals in our World Team Championship debut in Russia. Magnus said during the Olympiad that the success of the Polish team gave him hope for Norway, who he felt were at a comparable level, and in Chalkidiki the Norwegian club team Valerenga seem to be taking some tips from Poland. As well as overperforming they’ve shown their togetherness by sticking around after their games are over. 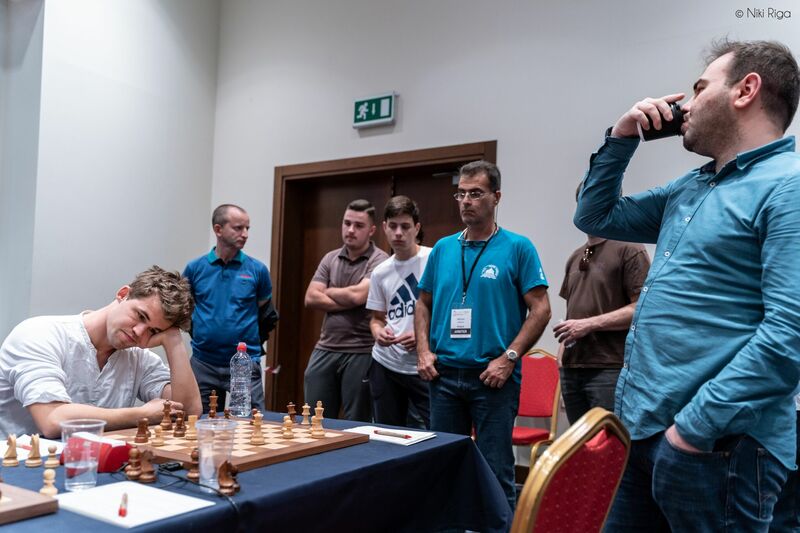 Magnus remained for another three hours after his game against Shakhriyar Mamedyarov ended in a rather tame draw, and continued watching after a draw between David Howell and Arkadij Naiditsch left only the game between Gadir Guseinov and Borki Predojevic. Black was clearly better, but could he win? 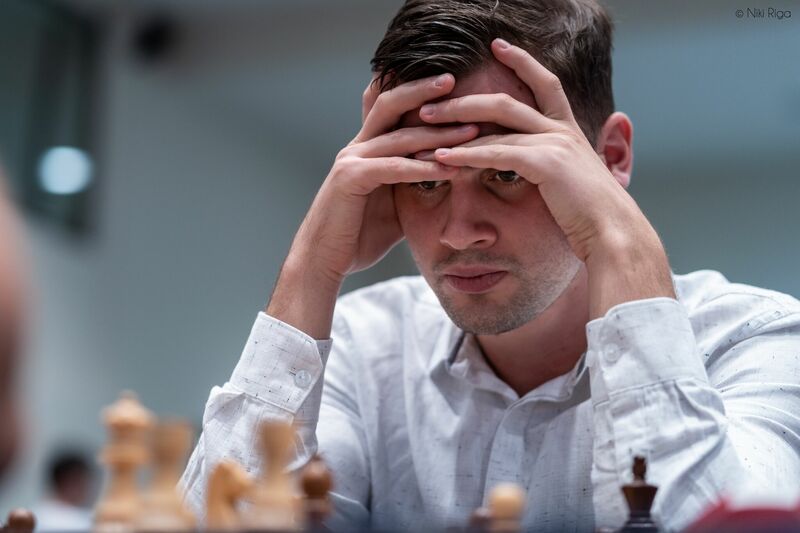 Well, for over 60 moves that remained unclear, but Guseinov finally cracked from the constant pressure and, perhaps, having the World Champion following the game so intently. He went for an exchange of rooks that led only to an opposite-coloured bishop ending that definitely wasn’t a draw. Resignation came on move 69. 24.f5! and Black resigned, since after 24…exf5 25.Nxg6! everything would have gone wrong. After 24.f5 it’s also too late to think about defending the rook, since then White will crash through on g6. One point below the leaders are four teams. Two of them, Itaka and Nordstrand Sjakklubb, are likely to be knocked back down again in Round 6, while the other two still look like medal contenders. The young Russian team of Molodezhka, led by Vladimir Potkin, have dropped only two half points since suffering a heavy loss against Valerenga. Christian Bauer took an agonising 22 minutes to come up with the winning 41…Nd3! 42.Kh1 Nf3 43.h4 Nxh4! Is it time to allow Peter finally to rest for one match, or will he continue in the hope that things must turn eventually. After this there's no time for a break, since he'll be taking on Sam Shankland in a 6-game classical match in Hoogeveen, starting this Saturday. In Round 6, the penultimate round, we have Valerenga against top seeds Alkaloid, meaning a potential Magnus Carlsen vs. Ding Liren clash. The other big match-up is AVE Novy Bor vs. Obiettivo, with a lot at stake as the teams attempt to enter the final day in medal contention. In the women’s section, meanwhile, we now know the semi-finalists. 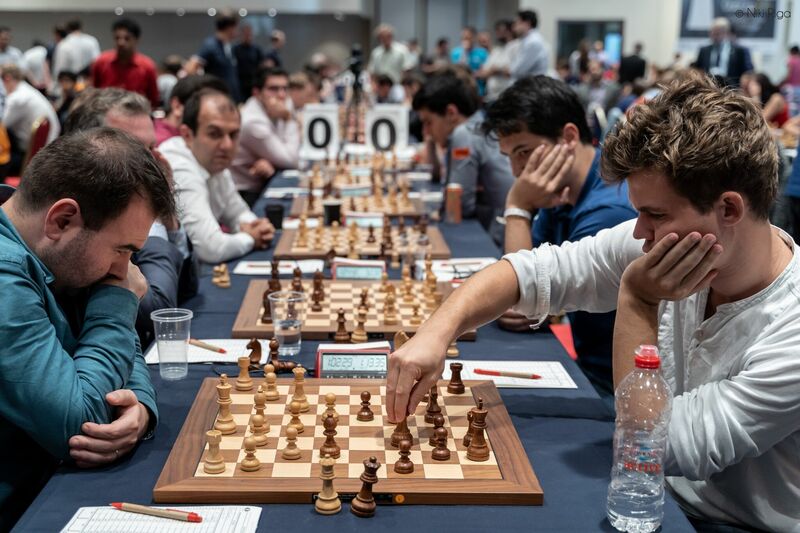 Top seeds Nona will play 7th seeds SSHOR, who scraped through despite losing in Round 5, while 2nd seeds Cercle d’Echecs de Monte-Carlo take on 4th seeds Ugra.